The Hi-Flo Industrial VacuPress® pump was designed specifically for professional woodworking shops that demand durability, dependability and versatility from their VacuPress®. Modeled after the original Standard VacuPress®, the Hi-Flo system delivers the same reliable performance with increased speed when needed by larger shops. This workhorse system offers maximum performance on all levels of veneering and laminating. The heart of the Hi-Flo Industrial VacuPress® is a maintenance-free 3/4 HP 10 cfm oil-less rotary vane vacuum pump chosen, like the Professional VacuPress® Pump, for its industry proven performance. This powerful veneer pump, combined with larger flow lines and double entrance vacuum bags, achieves full vacuum 100% faster. These features are extremely valuable when dealing with larger curved woodwork and multi bag operations (the Industrial Hi-Flo VacuPress® Pump can accommodate up to three veneer bags with the addition of our manifold adapter). The Hi-Flo Industrial VacuPress® pump is controlled by a state of the art, precision, “repeatably accurate”, digital vacuum switch for maintaining consistent vacuum levels. Easy to read, easy to adjust, our digital switch allows you to set both the pumps shut off and turn on points, independently from each other, providing infinite adjustability. This allows variable vacuum pressing settings necessary for the various pressure needs of high elevation shops, curved work, and different glue types. 3/4 HP self-adjusting oil-less rotary vane vacuum pump with thermal overload protection. 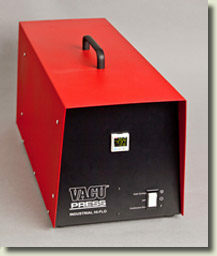 10 cfm vacuum rate for rapid evacuation time. Maximum vacuum of 27″ HG / automatic shutoff at 25″ HG (1774 lbs. per sq. foot). Easy access, see-through filter jar for dust removal. Quick disconnect between pump and bag. Vacuum gauge and lighted on/off switch for monitoring vacuum process. Pump dimensions: 10 1/4″ W x10 1/2″ H x 27″L. Operators manual with complete instructions on pressing veneers, curved woodwork, and veneering and laminating adhesives.